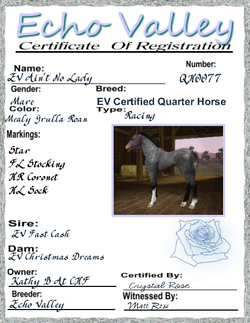 Lady is a grulla Quarter Horse mare. We have purchased her from Echo Valley. She is from a great line of horses, because her pedigree is full of foundation quarter horses. She is such an asset to our breeding program here at CHF. I am in love with this little mare.